ww2dbaseMikawa was born on 29 August 1888. He graduated from the Japanese Naval Academy in 1910 at the age of 22, and went on to serve aboard the cruiser Asama, battleship Satsuma, and later the battlecruiser Kongo. After attending Naval Torpedo and Gunnery Schools between 1913 and 1914, he served aboard the the cruiser Aso during World War I and the Sino-Japanese War. After serving aboard the destroyer Sugi and transport Seito, he attended Naval War College, and became a lieutenant in 1919 and was part of the delegation sent to France representing Japan. In the 1920s, he was navigation officer aboard a few ships, and taught at the Naval Torpedo School. After holding administrative posts, including posts in London, Paris, and at academies in Japan, Mikawa was promoted to Rear Admiral in 1936 and became Chief of Staff of the Second Fleet. He would command a number of fleets and battleships after which point. ww2dbaseIn 1940, Mikawa was promoted to Vice Admiral, and in 1942, he took command of the Eighth Fleet. Very soon after assuming command of the Eighth Fleet, he achieved a major tactical victory against American forces in the Battle of Savo Island. With a fleet of aging cruisers and two destroyers, Mikawa surprised the Allied fleet and sank four heavy cruisers and killed 1077 Allied seamen while losing none of his ships (though heavy cruiser Kako was sunk by submarine S44 during Mikawa's return trip, which is not technically part of the Battle of Savo Island). It is interesting to note that he did not take the opportunity to destroy the sitting duck Allied transports near by. ww2dbaseHowever, his victories would not continue. He would become involved in the losing campaigns to retake Guadalcanal and to hold New Guinea. He was recalled back to Japan in April 1943, served in Philippines briefly (Second South Sea Fleet), and assigned back to Japan again in October 1944. 29 Aug 1888 Gunichi Mikawa was born. 21 Jul 1942 Vice Admiral Gunichi Mikawa of the Japanese 8th Fleet based at Rabaul, New Britain, Bismarck Archipelago issued a request for more destroyers. 23 Jul 1942 Vice Admiral Gunichi Mikawa of the Japanese 8th Fleet based at Rabaul, New Britain, Bismarck Archipelago repeated his 21 Jul 1942 request for more destroyers. 18 Jul 1944 Vice Admiral Gunichi Mikawa was named the commanding officer of the Southwest Area Fleet. 15 Aug 1944 Vice Admiral Gunichi Mikawa was named the commanding officer of the 3rd Southern Expeditionary Fleet while still holding command of the Southwest Area Fleet. 1 Jan 1981 Gunichi Mikawa passed away. I've tried to put myself at the place of Mikawa and what i see is a man leading a fleet wich made a major score against a combined and superior enemy force (at least in numbers). We must remenber that V. A. Admiral Cruchtley was in charge, and he was a veteran from WWI lagest naval battle (Jutland), and USA carriers could be around. I don't know the orders that Mikawa received, if these included or not a strike against the transport ships (Vandergrif and his marines would be deeper in hell if it happened), but let's think something like this: it's night, we sunk 4 heavy cruisers, and damaged probably some other ships, the day is comming, my sailors are tired...so....we have th job done...let's go home. 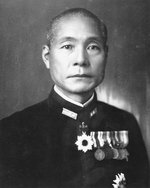 Vice Admiral Mikawa Gunichi has been, in my humble opinion, treated unfairly by historians, students, and 'buffs' alike for his withdrawal following the victory at Savo Island. 20-20 hindsight is a marvelous thing. Unfortunately, it makes for spurious history most of the time. The Vice Admiral did NOT know the US carriers had been withdrawn and acted in the best way according to the information he had. "What if" makes for interesting barroom banter, but one must be careful when presenting this sort of thinking as responsible history. A better use of the "what if" scenario should involve an analysis as to what made the US offensive in the Solomans possible - i.e Midway. We shall never know.